Paella Party Catering has become all the rage and for many good reasons. For your next party choose Paella it’s healthy, cost effective, entertaining and very versatile. 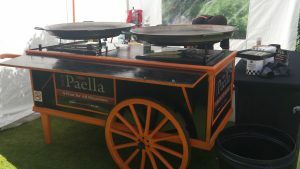 Your Paella cook and serve delicious Paella’s all over the UK for Party’s, Weddings and Corporate Events. Make the most of your party by hiring in the Paella Catering Service. 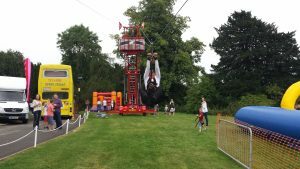 This will allow you to enjoy the Party with your guests and take a lot of stress out of what should be a fun filled day or evening for you as well as your very important guest. Hosting a successful party has many factors. One of the factors that can be over looked is the food that is offered to your guests. Your Paella offer a unique Paella Catering Service. With the aid of the famous “Paella Cart” that is totally unique to Your Paella. Your guests will not only watch Your Paella cook their meal they will also serve it to them from the “Paella Cart” and in many cases even interact with the professional Paella chef as they cook Your Paella. Your Paella offer much more than just fantastic tasting Paella’s. You can add various Tapas, hot and cold. Salads with bread butter rolls, a wide selection of mouth watering desserts. For Weddings a great option is to offer Spanish style canapes. Always a favorite with the Wedding party. Contact Your Paella today if you would like a free no obligation quote. Call us on 07989 079 231 for an immediate response. Watch a video of Your Paella in action below. Watch all of Your Paella’s videos here. https://www.yourpaella.co.uk/wp-content/uploads/2014/06/20140622_150057-2.jpg 1836 3264 Gary Evans https://www.yourpaella.co.uk/wp-content/uploads/2019/01/logotrans1-300x106-300x106.png Gary Evans2018-12-15 14:17:522018-12-15 14:17:52Paella Party Catering. 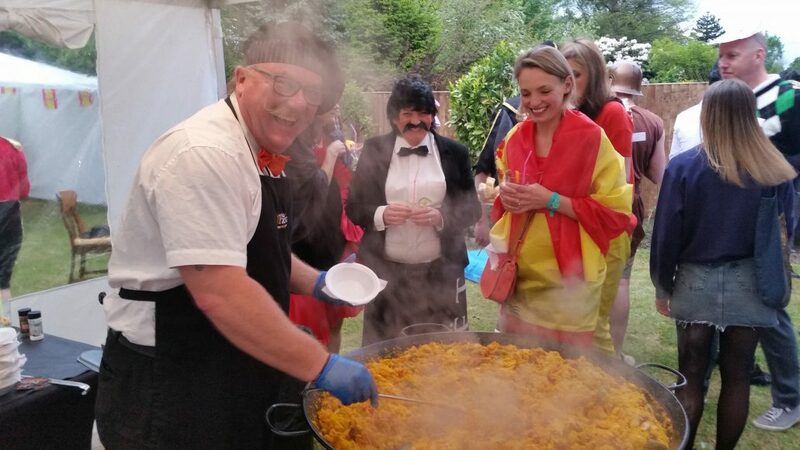 Paella Party Catering is one of the best types of Party catering and has become very popular across the UK. So why is Paella such a great choice for your Party? Well first of all it can be very cost effective when comparing what it could cost you if you’re thinking of doing the catering. Not only will you have to go out and get all of the necessary food from various supermarkets and stores you then have to get it all cooked on the day. So you spent a day or two getting all the ingredients, now you have all the stress of cooking for a large group of your family and friends and you really don’t want to get it wrong now do you? Just think of all the time you could save if you employ the services of a professional Paella caterer. Can You Enjoy Your Party If You Are So Busy? Now all your very important guests have arrived and you really have no time to relax and enjoy your party because you just have too many other things to do that will ensure everyone has some great food at your party. This sound like fun to you? No me neither. The stress Free Paella Party Catering Solution. Your Paella have been cooking and serving great tasting and healthy Paella’s all over the UK since 2011. With over 100 5 Star reviews online they can give you the perfect Paella Party Catering Service at a very cost effective price. So how can they be so cost effective? 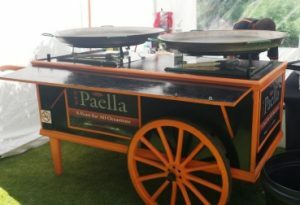 It’s really simple, because cooking Paella at Party’s, Weddings and Corporate Events is all Your Paella do they have everything in place from ingredients, Paella Cooking equipment, bowls, forks and so on and they buy wholesale so the cost of their ingredients has a good saving compared to a general member of the public that doesn’t have access to these wholesalers. Mixed green salad with tomato, cucumber and olives. 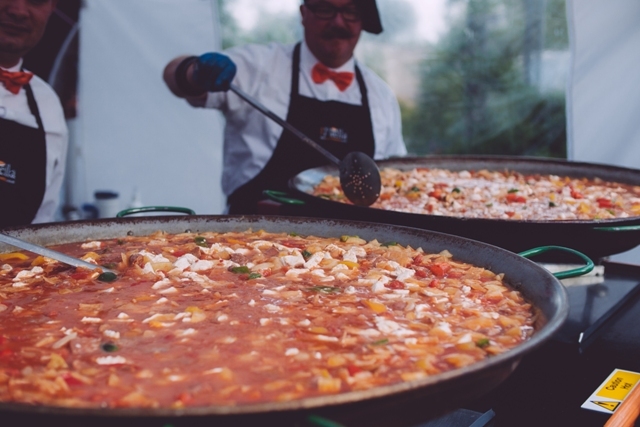 What other reasons are there to Book a Paella Party Catering Service? 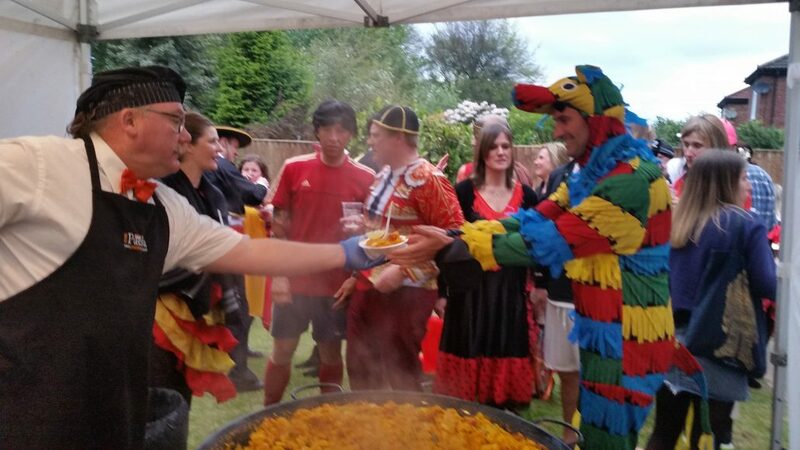 If you book Your Paella to cater for your Party not only will you be able to enjoy your party with the friends and family, it will also be stress free! You and your very important guests will really enjoy watching Your Paella cook delicious Paella’s in front of them and with the added attraction of the famous Paella Cart that is totally unique to Your Paella enjoying a theatrical cooking and serving experience that they have not seen before. 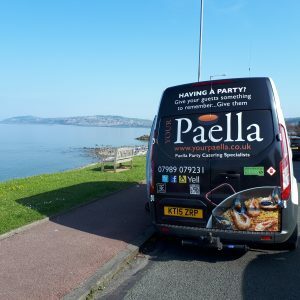 Now you have found the perfect Paella Party Catering Service why not Contact Us to get any other information or even a free no obligation quote? 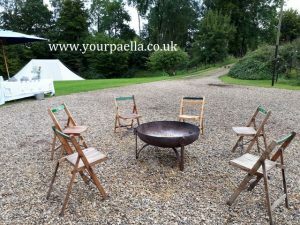 You can visit our main website www.yourpaella.co.uk or call us direct on 07989 079 231. You may like to watch a short video of Your Paella in action. You can see the video below and watch even more of the Your Paella videos here. Paella Catering for Weddings, Private Party’s and Corporate Events. 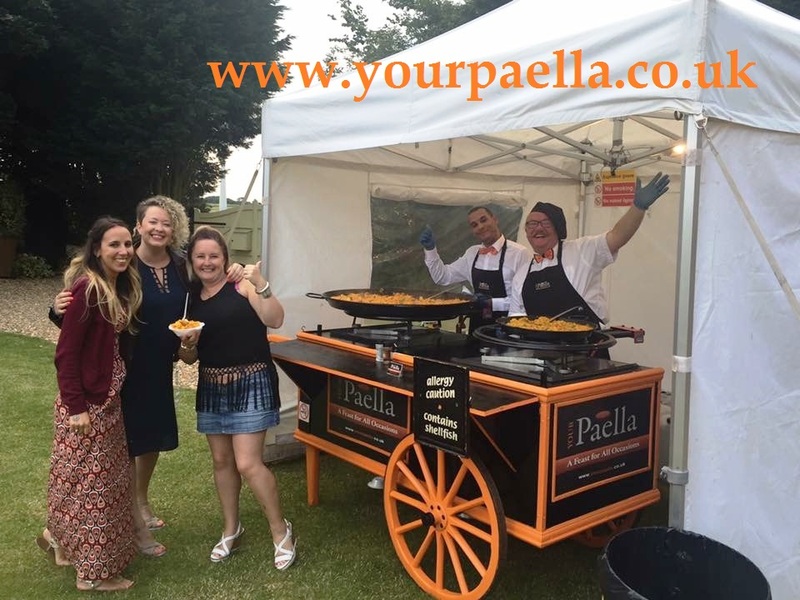 If you’re looking for Paella Catering at a Wedding, Private Party or Corporate Event you have landed on the right website. 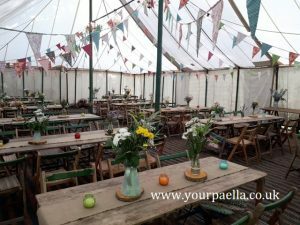 Your Paella catering service offers a totally unique catering experience for you and those very important guests. It’s so important to offer your guests more than just food. When you use Your Paella to cater at your Wedding, Private Party or Corporate Event the guests will be wowed by the sight and smells of delicious Paella’s being cooked in full view. 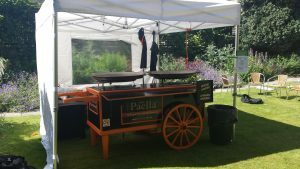 With the use of the unique “Paella Cart” Your Paella put on a great show and at the end provide you and your guests with delicious, healthy Paella. 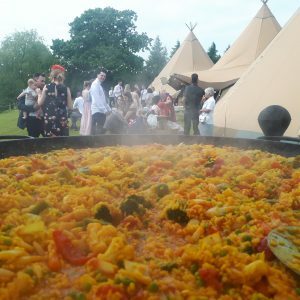 Your Paella offer their Paella Catering service across the whole of the UK. Based in Northamptonshire and South Yorkshire we have the whole of the UK covered. Your Paella offer Spanish Style Canapes, hot and cold Tapas, Salads, breads and of course fantastic tasting Paella’s. The price depends on many factors. Where will the Event take place? How many guests do you want to cater for? Do you want to supply more than Paella? The fact is the best way to find out what the cost for your event will be to contact us or call us on 07989079231. We are always happy to provide our perspective clients a free no obligation price. 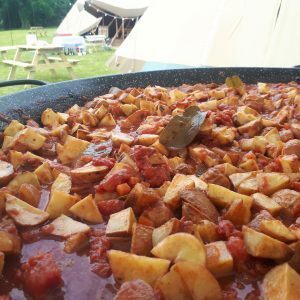 Don’t just take our word for how great the Your Paella Catering Service is, you can read some of our past clients reviews if you follow this link, https://www.yourpaella.co.uk/paella-catering-client-reviews/ once you are on that page you can click on each review to see where it’s been left on the internet. Professional Paella Chef’s cooking Your Paella. We have a range of Paella Videos that you may like to watch. 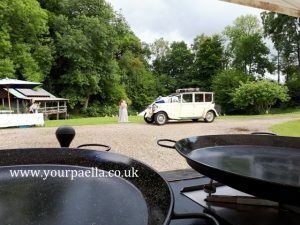 Just follow this link to see the Video’s https://www.yourpaella.co.uk/paella-videos/ Now you have found the perfect catering solution for your Wedding, Private Party or Corporate Event you need to secure the date before some other lucky person beats you too it! https://www.yourpaella.co.uk/wp-content/uploads/2018/05/20180526_130453.jpg 2448 2448 Gary Evans https://www.yourpaella.co.uk/wp-content/uploads/2019/01/logotrans1-300x106-300x106.png Gary Evans2018-12-01 15:12:482018-12-01 15:12:48Paella Catering for Weddings, Private Party's and Corporate Events. 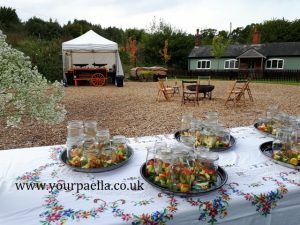 Your Paella recently catered for a Wedding in Derbyshire. The Bride and Groom had chosen a totally Vegetarian menu for their big day. As always we arrived in good time to prepare all of the food that was ordered for the wedding. The location for the wedding was stunning. The Bride and Groom had hired a huge Tipi from Sami Tipi and it looked amazing! The Tipi was facing a beautiful lake and the sunshine really added to the whole wedding day. 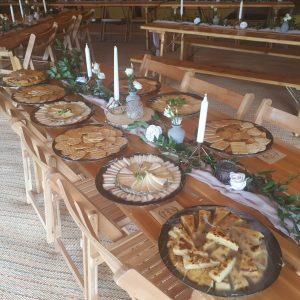 Upon arrival the wedding guests were given a nice glass of bubbly and inside the Tipi we have put together a selection of fine Spanish cheeses with a selection of crackers. We also supplied Spanish Tortilla cut in to cake slices. This was the perfect choice as the wedding asked us to cater solely for vegetarians. Beef tomato on french stick bread with a little onion and a dash of extra virgin olive oil was a simple yet refreshing bite on a hot sunny day. We also cooked a hot Tapas of Potatas Bravas. The Bride had asked us not to make it too spicy and as we made the Potatas Bravas sauce this wasn’t a problem. Again the perfect choice for Vegetarians. We then cooked a delicious Vegetarian Paella for the main meal. As usual we had our famous “Paella Cart” in attendance and this really wowed the wedding guests. If you are looking to hire a Paella Caterer you can contact us and we will be more than happy to give you a free no obligation quote. 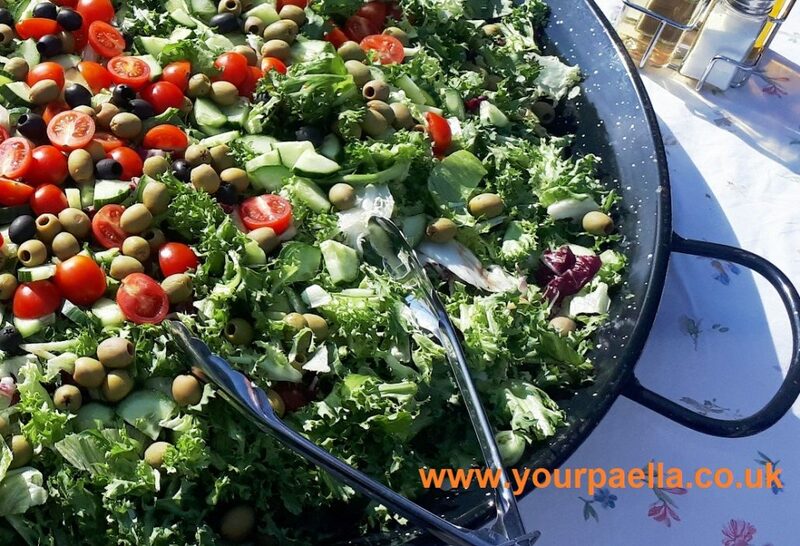 With over 80 5 STAR reviews online you can be sure of the perfect Paella Catering Service you are looking for. A Short Video Of The Day. https://www.yourpaella.co.uk/wp-content/uploads/2018/05/20180526_144420.jpg 2448 2448 Gary Evans https://www.yourpaella.co.uk/wp-content/uploads/2019/01/logotrans1-300x106-300x106.png Gary Evans2018-05-29 13:18:042018-05-29 13:25:14Paella Catering Derbyshire. Your Paella have cooked Paella all over the UK but some of the most beautiful areas we have been asked to cook have been in North Wales. 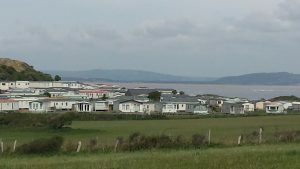 With it’s rolling hills and fantastic coast line North Wales has always been a favorite of ours to cook delicious Paella’s of all kinds. When catering for weddings or birthdays in North Wales we are always welcomed by such friendly people and as always it’s great to get such wonderful feedback on how great tasting Your Paella is. To be honest when we are working with such great people with some of the most spectacular views in the whole of the UK it’s not like work at all. 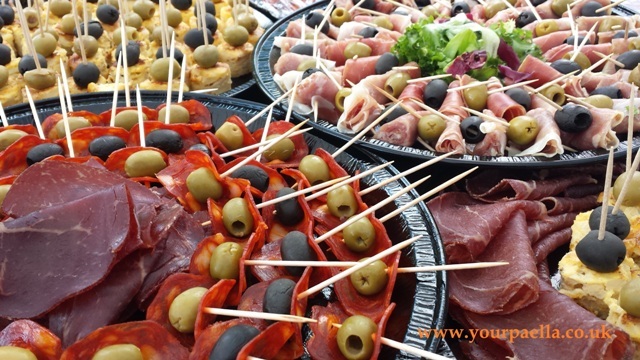 If you are having a special event and are looking to hire an outside catering company with a difference in North Wales or in any other part of the UK we would love to be able to give you a free no obligation quote. Booking Your Paella for a wedding, birthday or corporate event is a very easy task. 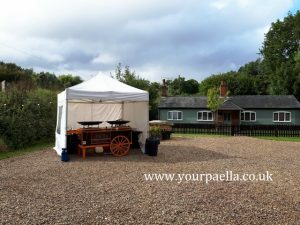 Firstly you can check out the main area of our website if you click www.yourpaella.co.uk this will give you lots of information about us and you can see our famous “Paella Cart” or you can contact us directly calling 07989079231 and we will be happy to talk about your requirements. Your Paella cook 3 main types of Paella, Mixed with Spanish chorizo sausage, breast of chicken and mixed shellfish, Meat with extra Spanish chorizo sausage and extra breast of chicken and a Vegetarian Paella that is suitable for vegans. We can also cook other types of Paella if needed. Along with Your Paella we also offer a range of Tapas and Spanish style canapes, mixed green salads with tomato, cucumber, olives and bread butter rolls. Deserts are also available if you would like them. 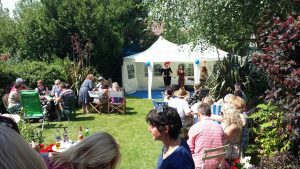 So for your next special occasion why not give yourself a break and let Your Paella take all of the strain out of the catering allowing you to fully relax and enjoy you party! 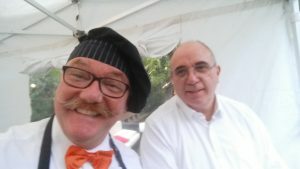 Paella catering in Cornwall has always been fun for the Paella catering professionals at Your Paella. 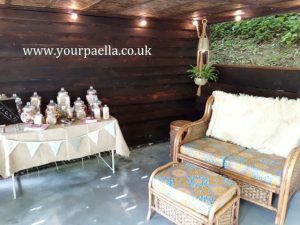 Paella catering on the Cornwall coast has always been great fun with some amazing Weddings catered for. 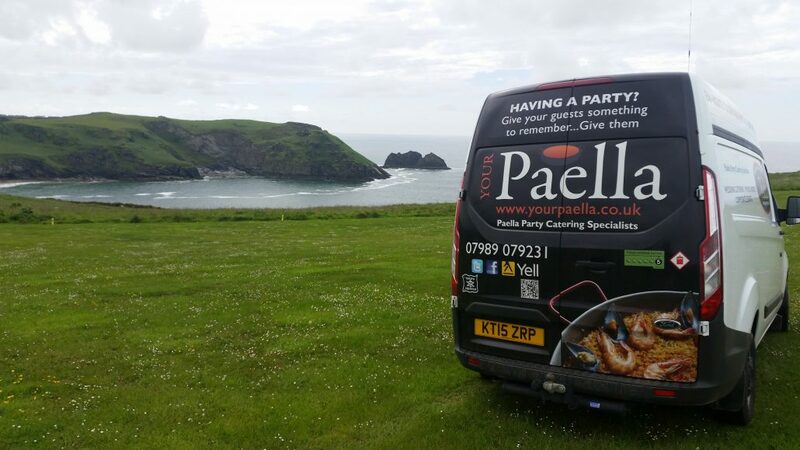 With views overlooking the Atlantic Ocean, Paella catering in Cornwall has been wonderful not just for the guests but for us too! 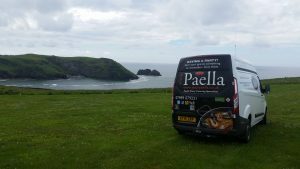 So if you are looking for a Paella catering service in Cornwall with a difference, please get in touch with us as we would just love to come and wow! you and your guests with the great sights and tastes of Your Paella. The Keeper And The Dell Wedding Venue Norfolk. 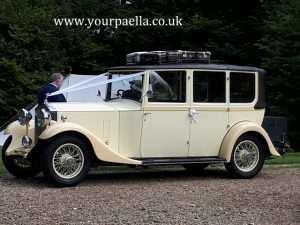 Hi and welcome to our review of The Keeper And The Dell Wedding Venue Norfolk. 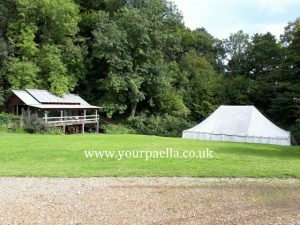 Your Paella catered for a wedding for 100 guests at The Keeper And The Dell in September 2017. We found this event location to be of a high standard. Everything was clean and tidy even down to the gravel. The staff rake the gravel to give it a very clean and crisp look. We had no problem with finding the venue even though it’s off the beaten track. In fact that really adds to the events charm. The facility’s are basic but that also adds to the overall charm. It has a really nice rustic feel that works perfectly if your looking to get married with a rustic country vibe. As caterers we had no problem getting our equipment in to the area that was given to us and was offered refreshments which was very kind of the hosts. They also made sure we had everything we needed to perform our task and that made this event flow with no problems at all. We would be delighted to cater at this venue again! 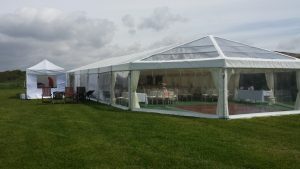 The whole site allows itself for all kinds of party’s with an on site marquee all ready with tables and chairs, even a relaxing area under cover to the left of the marquee under another large wooden building. On the edge of the main area there’s a row of barn type buildings that had a small bar area, seating area and also a coffee and tea making section. We found the staff to be efficient and friendly. We would recommend The Keeper And The Dell for any wedding or party! Ample parking was available on a large grassed area that sits above the main areas well out of site of the main area. https://www.yourpaella.co.uk/wp-content/uploads/2017/09/20170916_144203.jpg 480 640 Gary Evans https://www.yourpaella.co.uk/wp-content/uploads/2019/01/logotrans1-300x106-300x106.png Gary Evans2017-09-20 16:44:132017-09-20 20:56:21The Keeper And The Dell Wedding Venue Norfolk.